The study found that neighborhoods with dramatically more fast-food restaurants and convenience stores than supermarkets also have significantly elevated rates of obesity and diabetes. The study found a strong and direct relationship between the RFEI of the area in which someone lives and their likelihood of being obese or having diabetes. California adults living in high RFEI (Retail Food Environment Index) areas (RFEI of 5.0 or higher) had a 20 percent higher prevalence of obesity and a 23 percent higher prevalence of diabetes than their counterparts living in RFEI areas of 3.0 or lower. A higher RFEI was associated with a higher prevalence of obesity and diabetes for people living in lower-income and higher-income communities alike. The report doesn’t answer this, but I’m interested in hearing your theories. Here’s mine: The distance you drive to buy groceries effects how you shop. How this breaks down for me: I often walk over to SuperAmerica to buy a cookie. It’s only a couple blocks from my house, so I tend to only buy 1-2 cookies when I go there. 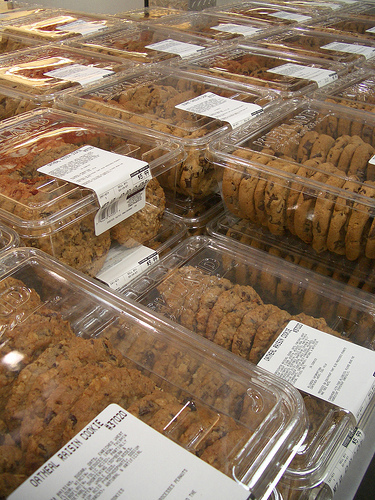 When I drive to a local grocery store like Cub I tend to buy a package of cookies rather than 1-2 individual cookies. And guess what? I’ll probably end up eating more than 1-2 cookies after I get home from the grocery store. Now scale this to driving to a Costco where I’d probably buy a box of packages of cookies because they’re such a good deal. The further I drive for cookies, the more I’ll buy when I’m there. I’ll spend more sedentary time riding in a car and end up consuming more calories by bulk-eating my bulk purchases. I see some correlations here with what I’d consider European styles of food shopping and eating. If you shop more often, you’ll buy fresher food in more sane quantities and have less urge to snack yourself into obesity on “family packs” of processed corn. 1. People who buy food by the cart vs basket. 2. People who’ve bought a car based on how many groceries it will hold. 4. People who “work the perimeter” vs “work the center” of grocery stores. Usually, the fresh stuff is on the perimeter and the more calorie-dense processed foods are in the center of stores. Yeah, you hit a couple points that I thought I would reinforce. Mainly the idea of the bargain not being a bargain and the Euro style shopping peaked my interest. Some people buy stuff only because they have a coupon (not because they really need or desire the new zesty ranch mesquite taco nacho flavor Doritos being test-marketed with that coupon) or buy the voluminous package because they can save 16 cents / oz (not because they really think they can eat or should eat 6 lbs of tater tots before the freezer burns them up). Then the USA approach of mega-markets where you buy mega-volumes of pre-packaged stuff to stock and forget in the back of the huge pantry, and you can buy these volumes because you drove your mini-van to the market to pick up your 8 bags of groceries…contrasts nicely with the Euro approach of small neighborhood markets where you only buy enough for a couple days because you walked there and you can only haul a couple bags of reasonably sized quantities. And the hidden point in your posting was your calories expended to calories consumed ratio. If you walk to SA and buy 2 cookies, you traded 6 blocks of walking for 200 calories of food. Whereas if you drive to Cub and buy a package of cookies, you maybe walked the equivalent of 3 blocks from your car through the store and back for your 2000 calories of food. The Euro approach means you are walking back to the store 2-3 times per week and hauling your groceries yourself instead of carting them to your car…big difference in calories burned. And, I miss being able to walk to the grocery store when I need some food. Yet another reason we need a quality grocery store/co-op in Longfellow. I’m thinking 38th and Hiawatha would be perfect for me, or on E Lake St, though that would compete with the new Seward Co-op. This is a huge issue in North Minneapolis, and they have the health problems to prove it. There is only ONE major grocery store on the whole Northside, and many residents in this area rely solely on public transportation. That’s why most people resort to fast food and convenience store eating. I agree that the idea of european style grocery shopping has a lot of advantages (walking to the store, buying smaller quantities of food and therefore wasting less, etc) but when you look at the small grocery store options on the northside there is a noticable lack of healthy food options. When was the last time you bought fresh produce from the SuperAmerica? There’s a new organization on the northside called the Northside Food Project that’s trying to educate the community about healthy food choices and increase the access to nutritious food using the coop model of community development. Lack of “food security” is a concept we usually associate with starving children in africa, but we’ve got a lot of people living in our own city who don’t have immediate access to healthy food. Thanks for the info, Claudia. By the way, I don’t know if this effects North or not, but there was a bill passed in March requiring markets to carry at least 5 varieties of fruits & vegetables, according to Cam Gordon’s blog. I’m not sure what defines a market, whether any are in North, or whether this will increase the amount of produce purchased or consumed, but it sounds like a small step in the right direction from what I understand about it. Next Next post: Gas = Bad. Sewage = Fine?